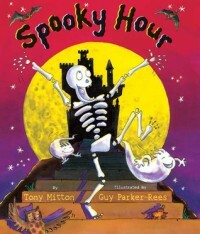 Spooky Hour is such a cute Halloween themed book! The clock bongs 12 times, and it's officially spooky hour! All of the goblins, monsters, witches, wizards, ghosts and more are coming out. It all ends up at fun birthday party with a huge birthday pumpkin pie! This book would be such a fun story to read during a Halloween celebration. Or it could even be used in a classroom to learn about sequence of events. The students could fill out a story map and write in what happened in the story in the correct order.